Kosse History - ​Welcome to Kosse, Texas! - A Little Town with a Big Heart The official web site of the Greater Kosse Chamber of Commerce. Kosse is located in Limestone County, Texas. KOSSE, TEXAS is situated on State highways 14 and 7 near the Falls county line in southwestern Limestone County. Settlers made homes by nearby Duck Creek in the mid -1840s and ran a stage stop for the Franklin -Springfield and Waco-Marlin stage routes. In 1869 Kosse became the end of the Houston and Texas Central Railway and was named for Theodore Kosse, a chief engineer for the railroad and the man who surveyed the road for the town. Businesses moved to Kosse from Eutaw, two miles west, and the Eutaw post office was moved to Kosse in 1870. Development of a town government began in 1871. The community reached a population of 500 by 1880. Union, Methodist, Baptist, and Presbyterian churches were organized. The New Era, the first newspaper, was published before 1880. The Cyclone was begun in 1885 by James O. Jones. That year the town had several cotton gins, two sawmills, and three gristmills. John Dimelow, an Englishman, opened a ceramics lab in 1870. Kosse also had the first brickyard in the county. On October 1, 1884, an acre of land was granted for a public school. Around 1892-93 Kosse became an independent school district with J. Thomas Hall as superintendent. In 1893 one school in Kosse had 225 students and six teachers, and another school had eighty African-American students. Today, Kosse students attend the highly rated Groesbeck ISD schools. ​In 1914 Kosse had three businesses, two banks, and a population of 700. In 1921 the chamber of commerce was organized. In August 1922 a huge oil gusher came in producing 8,000 to 10,00 barrels a day. Kosse's population boomed to 5,000 as a result of the Humphrey-Jones No. 1 .However, production suddenly ended and no other significant fields were found. By 1928 the population had declined to 1,500, and by 1931 Kosse had fifty-eight businesses. After that the population and number of businesses slowly began to decline. The Kosse schools were consolidated with the Groesbeck Independent School District in 1968. In 1989 Kosse had eleven businesses and a population of 519. In 1990 the population was 505. The 2010 census showed 515 Kosse residents. BIBLIOGRAPHY: A Family History of Limestone County (Dallas: Taylor, 1984). Memorial and Biographical History of Navarro, Henderson, Anderson, Limestone, Freestone, and Leon Counties (Chicago: Lewis, 1893). Doris Hollis Pemberton, Juneteenth at Comanche Crossing (Austin: Eakin Press, 1983). Ray A. Walter, A History of Limestone County (Austin: Von Boeckmann-Jones, 1959). Leonard Kubiak has published a history and many photos of Kosse and the Eutaw area as well on his website. This small one-story jail was located in Kosse. This structure is depicted on the Sanborn fire insurance maps dated 1899. Local residents said the calaboose was still there in the late 1950s. There was a freestanding metal cell or cage on the inside. Brothers Dr. Taz Ezell (left) and Dr. Bunyon Ezell about 1900. Both built homes that are still standing in Kosse today. The Bassett Farm is owned and under renovation by Preservation Texas. 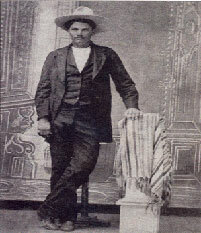 Notorious outlaw John Wesley Hardin killed a man in a downtown hotel in Kosse.